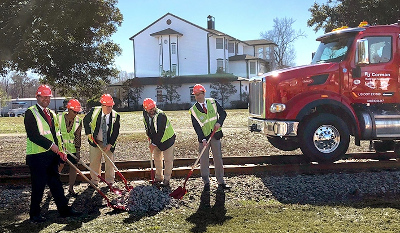 R. J. Corman Railroad Company Carolina Lines and South Carolina’s Horry County Government have broken ground on Moving the Carolinas Forward: A Rural Freight Rail Project. The $17.5 million project includes replacing approximately 60,000 crossties, upgrading nine miles of rail, upgrading nine bridges with a complete rebuild on a 220-foot bridge that spans the Crab Tree Swamp in Conway, S.C., and rehabilitating 39 at-grade crossings. R. J. Corman purchased the former Carolina Southern Railroad in August 2015. Trains are currently limited to 5 and 10 miles per hour due to the disrepair of the tracks. The project, which is expected to increase speed to 25 miles per hour, should be completed in Spring of 2022. The project is funded by a Federal Transportation Investment Generating Economic Recovery (TIGER) Grant as well as significant contributions from South Carolina and R. J. Corman.